Hey guys! Here today posting about my December goals and to see how many of my November goals I accomplished or kept working at. It was a pretty busy month with fall quarter coming to an end at school (which meant long final papers) and balancing family/friend and holiday stuff that I'm actually surprised to say I accomplished a good amount of these goals. -Keep up with my workout routine - I did keep up with working out throughout this month although not as often as I would have liked. I let a lot of external circumstances (like a freak cold week here of 5 degree weather) stop me from working out but I did commit when I could. - Plan annual Christmas trip for Sammy & I - Done! Off to Cedarburg, WI for their Christmas festival this weekend! Can't wait. Anyone ever been? It was ranked in the Top 5 Midwest cities to visit during the holidays by Midwest Living. -Research volunteer/charitable opportunities for December - Done! Sammy & I participated in the Salvation Army Angel Tree this year and bought clothes and gifts for several children. It was so much fun. I definitely encourage you to find your local chapter and participate if you're able to. I also looked into Project Linus where you donate a handmade blanket you make and they give it to a child battling a terminal illness. I'm really hoping to participate this year. -Fill out volunteer form for local animal shelter - I picked the shelter that I want to volunteer at but as soon as I mentioned it to my mom she got excited and wanted it to be a family volunteering so we're going to apply together this month hopefully. -Plan Christmas gift ideas per person - Done! Ms. Control Freak had her list done pretty early this year. & I'm only about two or three people from being done with all my Christmas shopping! -Finish my final paper of my undergrad career - Done! & I can't believe it. Graduate school, here I come. -Enroll in graduate classes - Speaking of coming... haha. Not quite there yet. Have the classes picked out and I have a spot in them but a certain tuition payment has to be made before I can officially enroll but I'm getting there! -Make some Black Friday plans - Done! My sister and I went to an outlet mall and our local mall and it was a lot of fun for us to do together although I now know why people only do this once a year haha. I was exhausted when we got home! -Register for The Ugly Sweater Run - I wanted to do this so badly but my boyfriend ended up accepting a new, full-time job that started the same weekend as this run so we weren't able to do it for scheduling reasons. I realize I could have done it alone but because the run seemed to be so social and festive I felt like I'd be somewhat of a loner on my own haha. Not too bad in my opinion but hopefully I can accomplish each of my goals for December considering most of them are going to be Christmas related I'm thinking haha. - Do something festive every.single.day. There they are! 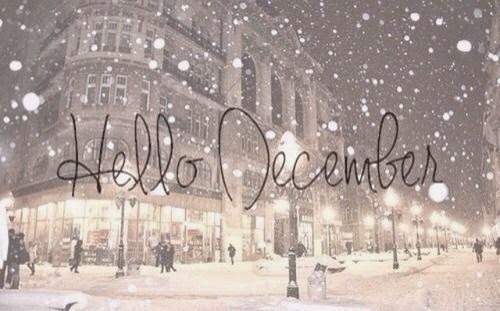 Here's a productive, fun, and festive month! What are your guys' goals for December? I'm glad you could achieve your goals, and good luck with December ones!